Drive by the Ross-Moro home and laneway house. You won’t know the structures were built much differently than other homes in the neighborhood. Both structures were constructed with Insulspan® Structural Insulated Panels (SIPs). LaneFab designed and built both homes. Designer, Bryn Davidson, and project manager, Mat Turner, started LaneFab. Designing and building with Insulspan is nothing new to the duo. “We have been using structural insulating panels for a majority of our projects since 2009. 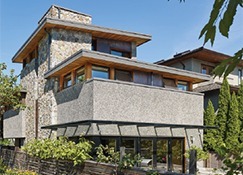 In my mind, there is a real connection between the construction materials and the design, so we usually talk to clients about using SIPs in the first meeting,” said Bryn. LaneFab’s clients sometimes have preconceptions about prefabricated homes. Thus, Bryn and Mat speak about the benefits of using a SIP system as part of their method to build quality, high-performance homes. SIPs have a number of benefits ranging from energy efficiency to sound reduction to the speed at which a building can have a roof on it. This last benefit is a huge time and cost savings in rainy Vancouver. 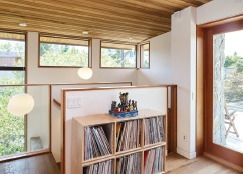 After the homeowners decided to use SIP panels, Bryn started designing their 2,600-square-foot home and 710-square-foot laneway house. Both structures beautifully mix the homeowners aesthetic tastes of west coast and classic Italian architecture. The main home includes a three-story elevator. It allows one of the owners, who uses a wheelchair, access to the rooftop deck. While the homes are distinct, they have the signature LaneFab look. “Over time, we have found SIPs give a slightly different look to our buildings. We are able to mount the windows in the center of the thicker than normal wall which gives us a deep exterior window reveal,” said Bryn. In addition, since the SIP roof panels are actually acting as the structure versus having typical header beams, Bryn has design flexibility to put windows high on the walls, tight to the ceiling, flooding the city homes he designs with light while providing privacy. 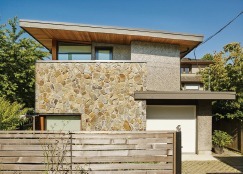 With R-40 SIP walls and R-50 SIP roof panels, along with LaneFab’s hybrid building system and other energy saving features like heat recovery ventilators, the home and laneway house were able to achieve EnerGuide ratings of 86 and 88 respectively. For comparison, the Canadian EnerGuide system rates a netzero energy home as 100 while a 0 represents an existing house not upgraded. So, what is next for LaneFab? They are building several passive houses utilizing Insulspan SIPs.